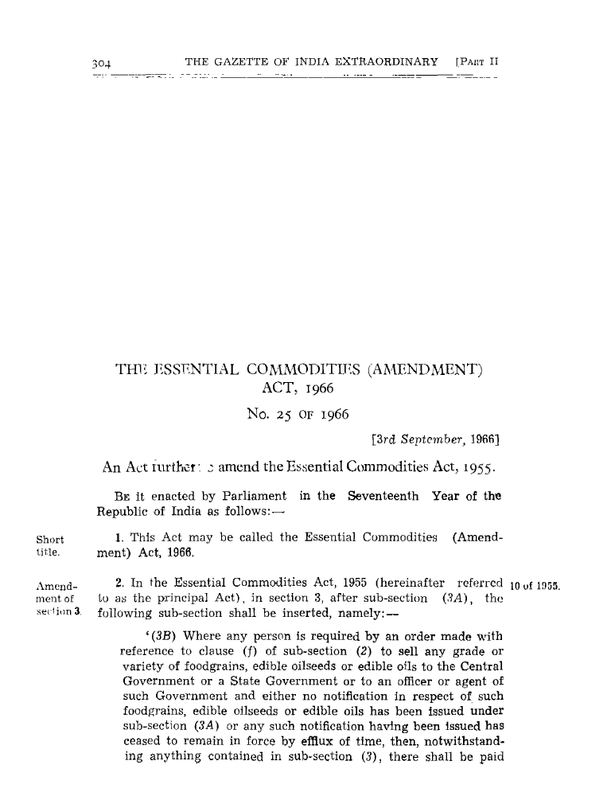 This Act may be called the Essential Commodities (Amendment) Act, 1966. (ii) the price for such grade or variety of foodgrains, edible oilseeds or edible oils prevailing or likely to prevail during the post-harvest period in the area to which that order applies. Explanation.—For the purposes of this sub-section, "post-harvest period" in relation to any area means a period of four months beginning from the last day of the fortnight during which harvesting operations normally commence.'. "6A. Confiscation of foodgrains, edible oilseeds and edible oils. 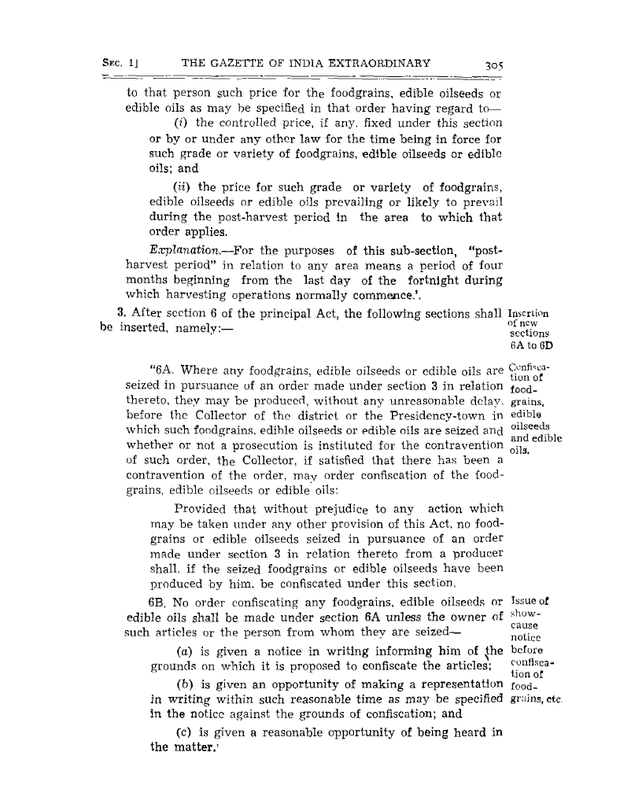 Provided that without prejudice to any action which may be taken under any other provision of this Act, no foodgrains or edible oilseeds seized in pursuance of an order made under section 3 in relation thereto from a producer shall, if the seized foodgrains or edible oilseeds have been produced by him, be confiscated under this section. 6B. Issue of showcause notice before confiscation of foodgrains, etc. (1) Any person aggrieved by an order of confiscation under section 6A may, within one month from the date of the communication to him of such order, appeal to any judicial authority appointed by the State Government concerned and the judicial authority shall, after giving an opportunity to the appellant to be heard, pass such order as it may think fit, confirming, modifying or annulling the order appealed against. 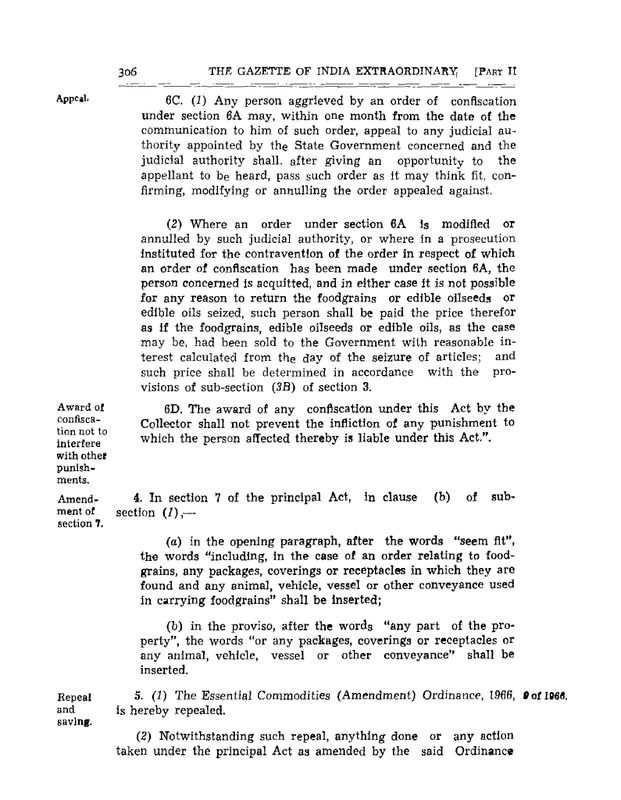 (2) Where an order under section 6A is modified or annulled by such judicial authority, or where in a prosecution Instituted for the contravention of the order in respect of which an order of confiscation has been made under section 6A, the person concerned is acquitted, and in either case It is not possible for any reason to return the foodgrains or edible oilseeds or edible oils seized, such person shall be paid the price therefor as if the foodgrains, edible oilseeds or edible oils, as the case may be, had been sold to the Government with reasonable interest calculated from the day of the seizure of articles; and such price shall be determined in accordance with the provisions of sub-section (3B) of section 3. 6D. Award of confiscation not to interfere with other punishments. The award of any confiscation under this Act by the Collector shall not prevent the infliction of any punishment to which the person affected thereby is liable under this Act.". (b) in the proviso, after the words "any part of the property", the words "or any packages, coverings or receptacles or any animal, vehicle, vessel or other conveyance" shall be inserted. (1) The Essential Commodities (Amendment) Ordinance, 1966, is hereby repealed. 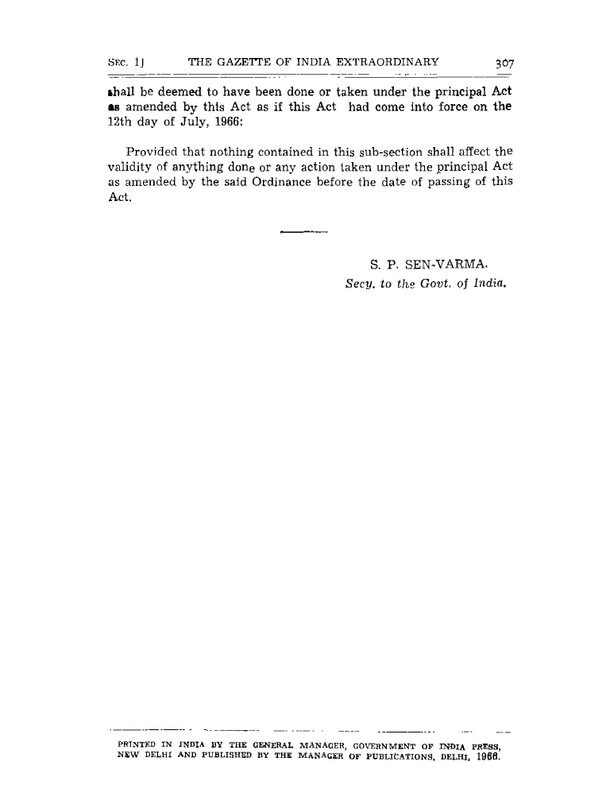 Provided that nothing contained in this sub-section shall affect the validity of anything done or any action taken under the principal Act as amended by the said Ordinance before the date of passing of this Act.